Upon arrival of French forces in Newport, Rhode Island in July 1780, Baron Ludwig von Closen, a captain in the Royal Deux-Ponts Regiment, was selected by General Rochambeau as one of his aides-de-camp. Closen accompanied Rochambeau on most of his visits with General Washington and was chosen as courier of many important communications, including messages to the French fleet commanders Admirals de Barras and De Grasse. Closen kept a detailed diary of his activities throughout his stay in America, including the Yorktown Campaign of 1781. 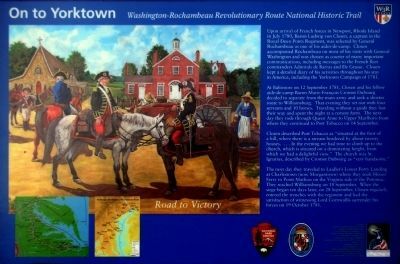 At Baltimore on 12 September 1781, Closen and his fellow aide-de-camp Baron Marie-Francois Cromot Dubourg decided to separate from the main army and seek a shorter route to Williamsburg. That evening they set out with four servants and 10 horses. Traveling without a guide they lost their way and spent the night at a remote farm. 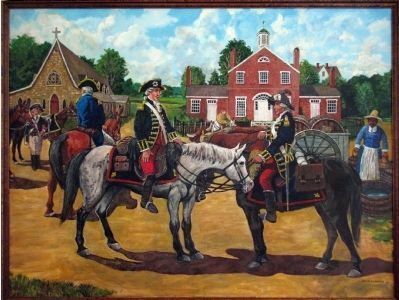 The next day they rode through Queen Anne to Upper Marlboro from where they continued to Port Tobaccco on 14 September. Half of the marker is visible on the right side of image. to climb up to the church, which is situated on a dominating height, from which we had a delightful view." The church was St. Ignatius, described by Cromot Dubourg as "very handsome." The next day they traveled to Laidler's Lower Ferry Landing at Charlestown (now Morgantown) where they took Hooes' Ferry to Point Mathias on the Virginia side of the Potomac. They reached Williamsburg on 18 September, Closen regularly entered the trenches with the regiment and had the satisfaction of witnessing Lord Cornwallis surrender his forces on 19 October 1781. Location. 38° 30.676′ N, 77° 1.195′ W. Marker is in Port Tobacco, Maryland, in Charles County. Touch for map. 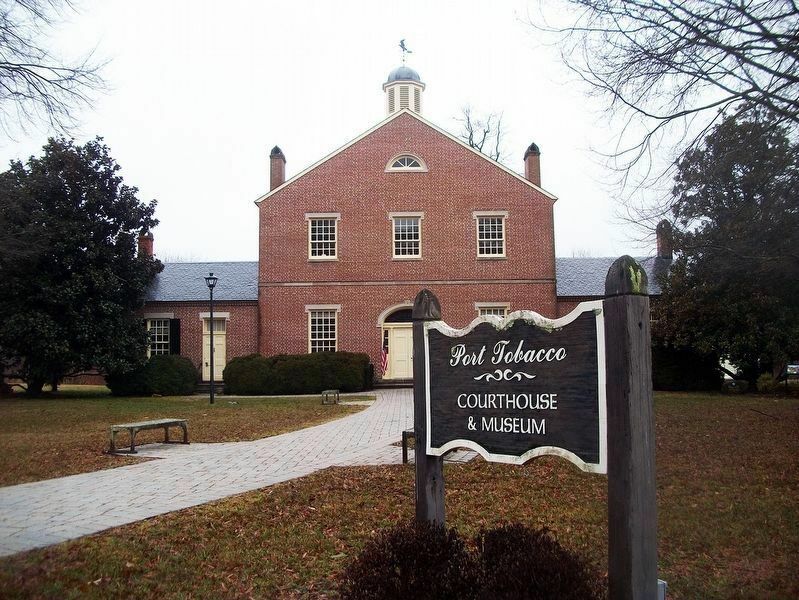 Marker is in front of the Port Tobacco Courthouse Museum on Chapel Point Road off Route 6. Marker is in this post office area: Port Tobacco MD 20677, United States of America. Touch for directions. 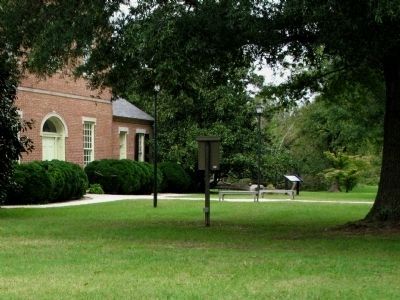 (within shouting distance of this marker); Port Tobacco Jail (about 400 feet away, measured in a direct line); a different marker also named Port Tobacco (approx. 0.3 miles away); Daniel of St. Thomas Jenifer (approx. 0.9 miles away). Touch for a list and map of all markers in Port Tobacco. David R. Wagner's painting hangs in the Port Tobacco Courthouse Museum. It shows Rochambeau's Aides-de-camp the Comte du Bourg (on the left) and Baron von Closen (on the right) at Port Tobacco. Credits. This page was last revised on January 30, 2019. This page originally submitted on January 21, 2013, by Allen C. Browne of Silver Spring, Maryland. This page has been viewed 675 times since then and 28 times this year. Photos: 1. submitted on January 21, 2013, by Allen C. Browne of Silver Spring, Maryland. 2. submitted on January 17, 2019, by David Lassman of Waldorf, Maryland. 3, 4. submitted on January 21, 2013, by Allen C. Browne of Silver Spring, Maryland. • Bill Pfingsten was the editor who published this page.